Times are tough for Miles Morales: The Ultimate Spider-Man. His father and his girlfriend aren’t speaking to him after he revealed his secret identity, former Spider-Man Peter Parker is seemingly back from the dead, and the man who killed Peter, Norman Osborn, has returned to kill another arachnid-themed superhero. As if that’s not enough, Miles got shot at the end of last issue, leaving him confused, overwhelmed, and losing blood. The character’s current comic-book circumstances aren’t great, but his profile is steadily expanding within the Marvel universe, and not just the one on paper. 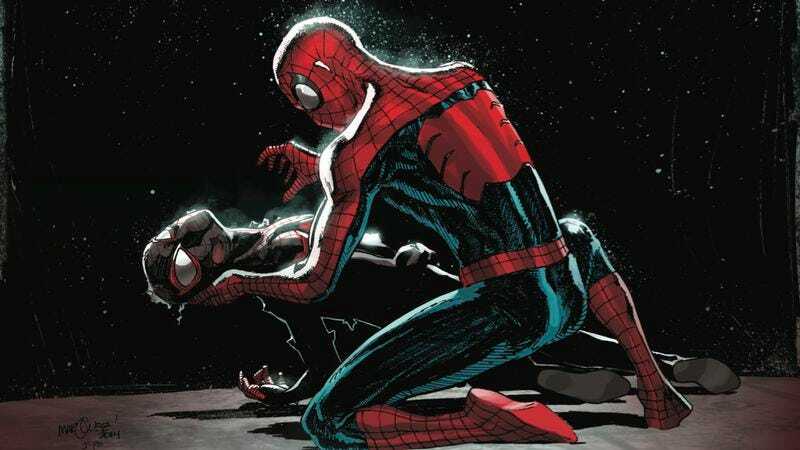 Last month, it was announced that Donald Glover—whose campaign to be the next movie Spider-Man was part of Brian Michael Bendis’ inspiration for the creation of Miles—will be voicing Morales in the animated series Ultimate Spider-Man: Web Warriors, which will see Peter Parker meeting the Spider-Men of alternate dimensions. And there’s even more Miles-related dimension-jumping in the comics: Bendis’ All-New X-Men leaps into the Ultimate universe next week for a Miles guest appearance, and the character will also be a part of this fall’s “Spider-Verse” event unfolding in Dan Slott’s Amazing Spider-Man and assorted alternate reality tie-ins. It’s safe to assume that Miles is going to make it out of this current scuffle alright, and Detective Maria Hill is the person to thank for that. She rescues the wounded Spider-Man in this preview of next week’s Miles Morales: The Ultimate Spider-Man #5, which takes a break from the white-knuckle action of last month’s brawl between Miles and Osborn to set up a new alliance between the detective and the vigilante. The preview is an opportunity for artist David Marquez and colorist Justin Ponsor to show their skill with more grounded character moments. But judging by the cover, Miles still has plenty of fighting ahead of him.